Don’t get me wrong, I love a traditional jack-o’-lantern as much as the next girl, but there’s something so fun about coming up with a new way to decorate pumpkins each year. You could go the goofy route or the macabre route or the artistic route, but I personally like to decorate my front porch with pieces inspired by the trends I love for the interior. And this year, that’s terrazzo. The traditional Italian material is peppered with haphazard flecks of color and can infuse a bit of cheery chicness into virtually any space (which is much more up my alley that spooky scary Halloween decor). Meet our painted and carved terrazzo pumpkin! This treat of a pumpkin doesn’t require any tricks — it’s super easy to put together and looks great on a well-styled front porch. The first step in creating your terrazzo pumpkin will be a familiar one to those of you who grew up carving pumpkins. Use a serrated knife to cut a circle around the stem. Try to angle the knife out a little bit to create a slight V shape when you pull out the stem. This will help it not to fall into the pumpkin (which, as you can probably agree, is very, very frustrating). Use a big spoon to scoop out all the seeds and pumpkin guts. Don’t be afraid to get in there and get messy, as well! Once you have all the big pieces out, go back in with the spoon and really scrape down the bottom and sides so they are smooth and gunk free. This will help keep your pumpkin nice and fresh for longer. Side note: don’t throw away the seeds! Quickly clean them off, pour some melted butter and some salt over them and spread them on a sheet pan to roast until they just start to turn light brown. Try our pumpkin trail mix recipe, too, because it makes such a delicious fall snack. 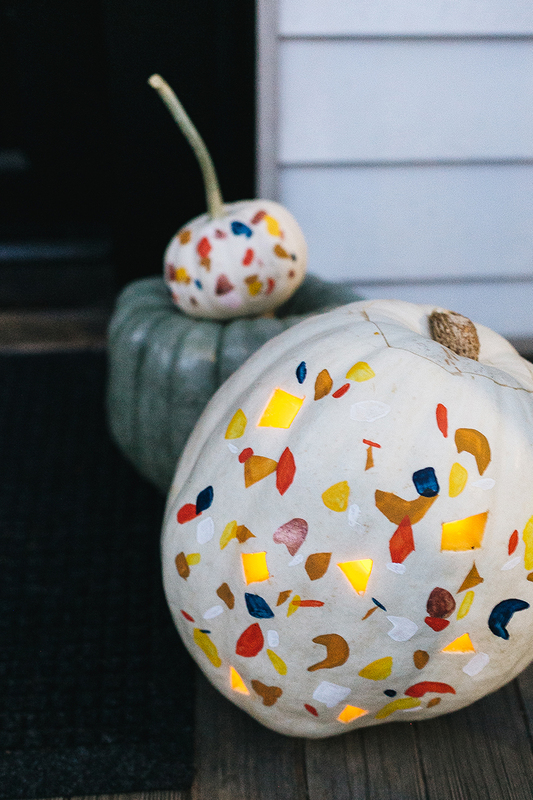 There are a couple of ways to go about painting your terrazzo pattern on the pumpkin, and we’ll go ahead and cover both of them. First, grab a roll of this super-handy stencil paper. It’s essentially sticky, clear contact paper that’s designed to be used to create custom stencils and I’m obsessed with it (I highly recommend keeping a roll around, since you’ll find so many random uses for it). Cut out a small rectangle, then go in with your X-acto knife and start cutting out small, geometric shapes in random spots. You’ll want some with sharp, straight edges and some that are more rounded for that perfectly undone terrazzo look. Don’t make the shapes too crowded, because you’ll be adding more, layer by layer, so we want to leave some space. Next, position the stencil on top of the pumpkin to see where you want it to go. 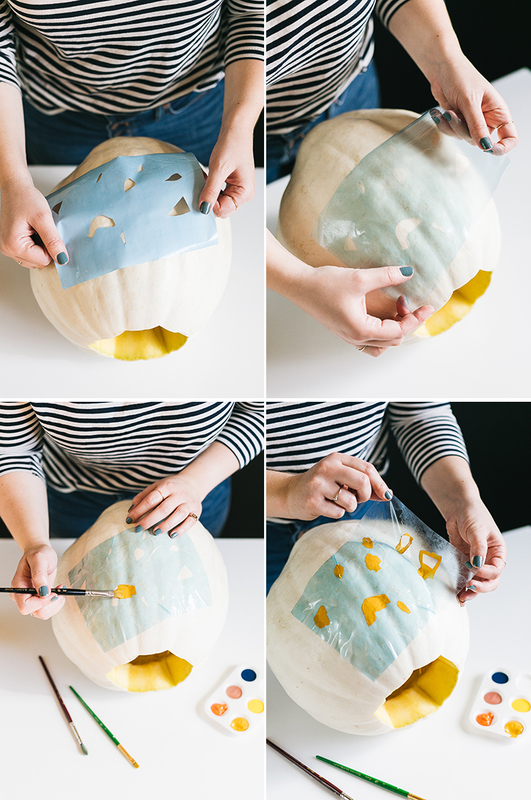 Peel off the backing of the stencil paper and carefully place the stencil on top of the pumpkin. Use your fingers to smooth the stencil down, paying special attention to the edges of the cutouts, since we don’t want any paint to seep under. 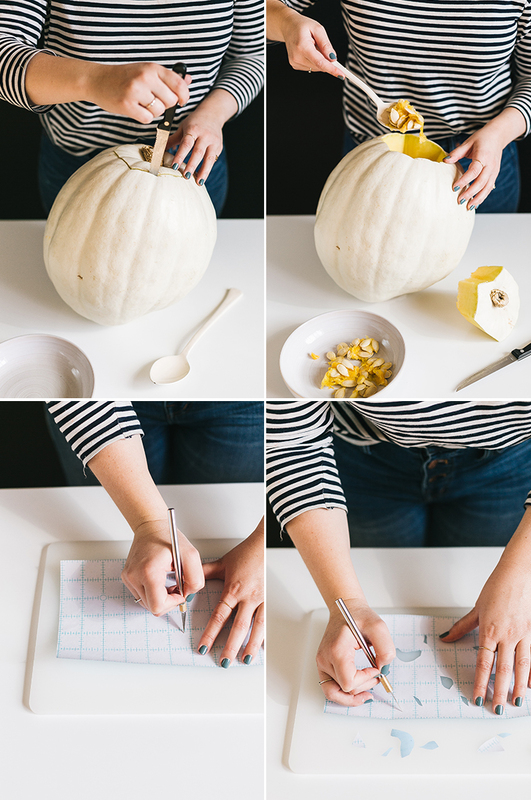 It’s okay if your stencil has a few bumps in it — it’s sort of unavoidable since the pumpkin itself is curved. Once you’re happy with the placement and seal of the stencil, paint over the openings with one color. We’re essentially going to be doing one color at a time, building layer by layer to create that terrazzo effect. I opted for a warm palette of mustard, gold, copper and yellow with pops of white and navy, but you can go with whatever colors suit your fancy. Just try to keep them in a somewhat cohesive range for a more traditional look. After the paint has dried for a couple of minutes, carefully peel off the stencil by lifting one edge and pulling upwards. Once that layer of paint has dried completely, you can either reposition the stencil and repeat the process, or you can move on to the other method of painting: freehand. I opted to use both because I liked the variation it brought to my shapes. 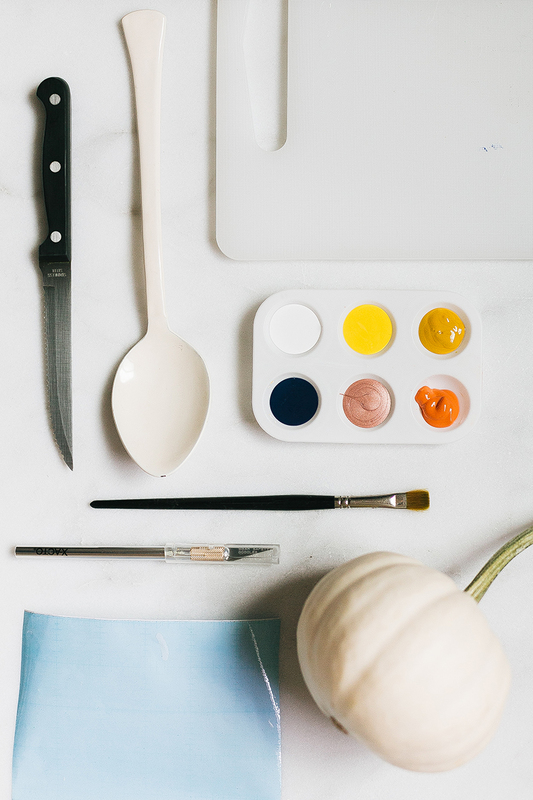 If you’re choosing to freehand paint, simply dip your brush and get going! Again, you’ll want to work with one color at a time, building layer by layer of cute little geometric shapes. I liked to use the paintbrush to create some smaller marks and some curvier swooshes that were harder to achieve with the stencil. Don’t forget to overlap some of your shapes to create that realistic look. The last step to complete these terrazzo pumpkins is to carve out some little geometric shapes to match the pattern. Start by tracing out the shapes with a pen, so you have a guide of where you’d like the cut, then go back in with your serrated knife and cut out the little shapes. I love the way the light shines through these cutouts to add glowing dimension to the traditional terrazzo pattern. 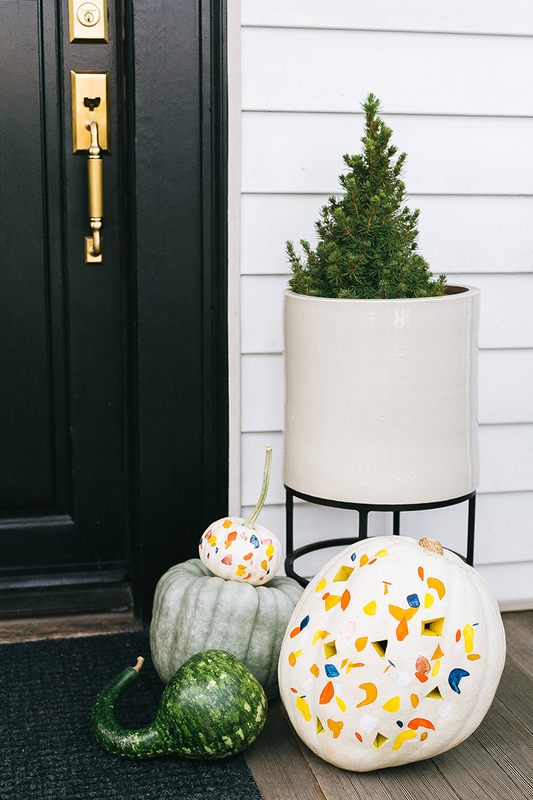 There’s something so fun about combining painting with carving to create the perfect terrazzo pumpkin for your front porch. 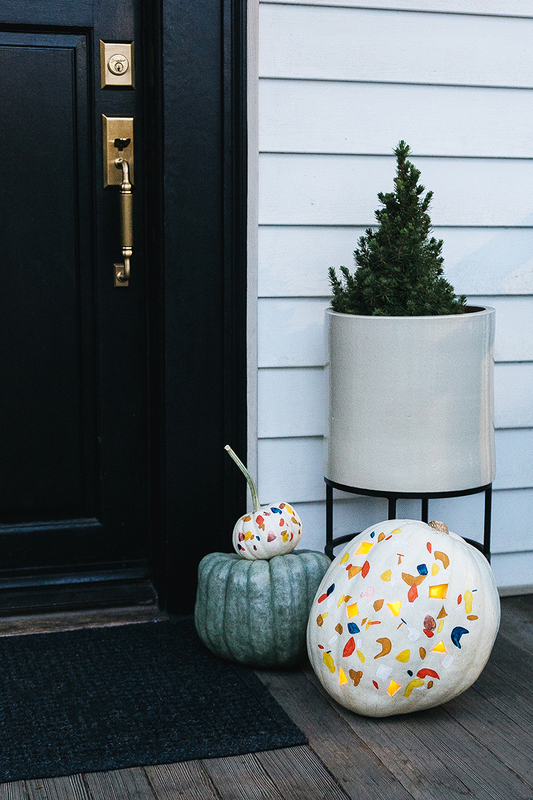 Don’t these terrazzo pumpkins just pop against Joanna’s dreamy black front door? I hope the trick-or-treaters in her neighborhood like them! photography and styling by Jojotastic, DIY by Hannah Cross for Jojotastic.